His record and his peers would suggest otherwise. Palkovic, who got a job washing big trucks at Curtze on Saturdays for $2 a truck in 1975, has been driving for the company for 41 years — without a record of an accident or a moving violation. How unusual is that? 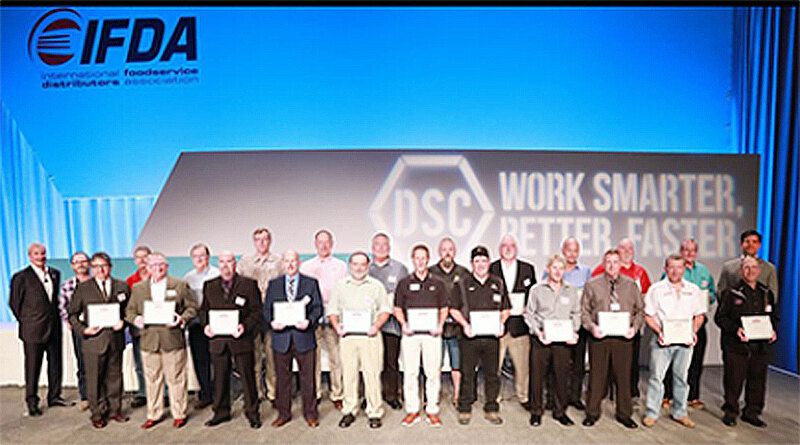 Consider this: In October, the International Food Distributors Association, whose members employ 109,000 truck drivers nationwide, inducted its first Hall of Fame class of 26 at a ceremony in San Antonio. Palkovic isn’t prone to speech-making when it comes to his chosen career. It is second nature, like the natural hitter who seems to have been born knowing how to hit a curveball but doesn’t think there’s anything special about his skill. “It’s just a job, how I make my money, like anything else,” he said. As he talks, though, Palkovic’s eyes are making a constant sweep of the road, signaling and then easing into the left lane as he takes note of the flashing lights of a police cruiser that is parked on the berm more than a mile ahead. “Some of these guys don’t pay any attention,” he said with a shake of his head. Palkovic said there are no tricks to what he does, though he said he drives slower than some. He isn’t inclined to grumbling, but he’s not a fan of people who do other things when they drive. Don’t get him started on the tell-tale signs of drivers who are texting as they pass by. For him, this never-ending scan of his mirrors, his gauges and watching the horizon isn’t anything special. It’s the job. As easy as shifting through the 10 gears on this big diesel. It’s how he earns a living, the price of working alone and mostly unsupervised. Palkovic, who rises for work at about 12:30 a.m., usually leaves home a few minutes before 2 a.m. On Feb. 5, he had two trailers loaded and was headed up Route 5 for Buffalo by about 3:30 a.m. Palkovic, who savors the solitude of an empty truck cab, likes driving through the night on Route 5 for the same reasons. There is less traffic to worry about, fewer distractions. He’s not a fan of distractions. There is no CB in his truck. He got rid of it about 20 years ago. There are times, he said, that he misses knowing what’s going on up ahead. He doesn’t miss the language and constant commentary. The AM/FM radio is his companion most days. Palkovic said he’ll listen to most any kind of music. “Not really classical,” he said. By law, truck drivers aren’t allowed to talk on handheld cell phones while they drive. Some use headsets. But Palkovic, who has a flip phone, makes his calls when the truck is stopped. Otherwise, the phone might ring, but he doesn’t answer. Pulling double trailers usually is a task assigned to the most experienced drivers, but in many ways the work Palkovic does today has grown easier. There are fewer deliveries, not so many ramps to push loads up and down. Whether he’s hitching up a trailer in the subzero dead of night or trying to find the edge of his lane on a snow-covered highway, winter is a reminder that this isn’t easy work. The prospect of driving down a snow-covered highway in the midst of a snow squall does not fill him with anticipation. “There are days I really don’t want to drive,” he said. “But if it’s bad, I just go slower.” The only alternative is calling in sick. And that just makes a bad winter’s drive someone else’s problem, he said. Palkovic doesn’t make much of his safety record or the lack of encounters with police. Steve Gerg, senior operations manager for Curtze, who drove a truck for the company for about nine years, knows a blemish-free record is no fluke. He and his wife, Robin, flew with his bosses at Curtze to Texas this past fall for his induction into the Hall of Fame. It was an honor, and they had a nice time, he said. For the most part, though, this man who has made his living on the highway said he’s not big on traveling. And he’s certainly not putting together a wish list of places to go when he does retire.